Andy qualified from the University of Bristol in 1988 and worked initially in the Midlands where he gained a postgraduate qualification in Equine Practice before coming to Liphook in 1994. After a brief period away in Sussex, he returned to Liphook in 1999 and became a partner in 2001. He gained the RCVS Diploma of Equine Internal Medicine in 2003 and the Diploma of the European College of Equine Internal Medicine the following year. 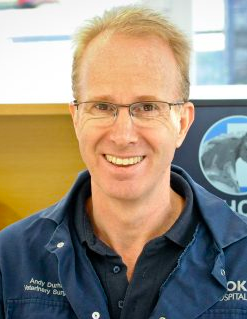 Andy acts as a consultant for internal medicine providing a referral service for referring vets and has a particular interest in equine metabolic syndrome, liver disease and ophthalmology. Andy has published extensively on a wide range of equine medicine subjects and lectures frequently both in the UK and abroad. In addition to his role as medicine consultant, he runs the diagnostic laboratory within the hospital which provides rapid analysis and interpretation of results of samples from within the practice, referral hospital and those sent in by referring veterinary surgeons.